TORONTO, Feb. 11, 2019 (GLOBE NEWSWIRE) -- North American Palladium Ltd. ("NAP" or the "Company") (TSX:PDL) (OTC PINK:PALDF) today provided an update on its 2018 exploration programs at the Lac des Iles Mine (“LDI”) property, located 90 kms north of Thunder Bay, Ontario. All dollar amounts cited refer to Canadian dollars. Recent exploration has defined seven underground targets in the southern part of the deposit and several discrete near-surface exploration targets, all of which are expected to be drilled in 2019. Geophysical survey and drilling results from the Creek Zone in the eastern part of the property, including holes 18–006 (25 metres of 2.57 g/t Pd) and 18–007 (22 metres of 3.74 g/t Pd including 13 metres of 5.18 g/t Pd), make this the top-ranked target among the growing number of discrete, near-surface drilling targets. Five discrete bodies of palladium mineralization with typical grades similar to the current underground reserves are now recognized within or directly adjacent to the Offset South Zone and the sub-level shrinkage (“SLS”) mining area. These include the already-developed B2 Zone, the recently-delineated B1 and B3 Zones, the Mystery Zone, and the modeled-down plunge extension of the Sheriff South Zone. The best result obtained during the 2018 drill program was from the B3 Zone, where hole 18–805 intersected 138 metres of 3.02 g/t Pd, including a higher-grade section with 32 metres of 9.19 g/t Pd, which includes 11 metres of 17.8 g/t Pd. A new area of palladium mineralization named the C Zone was discovered in the footwall to the Offset Zone deposit. Initial drilling results include a 20.8-metre intersection of 3.50 g/t Pd in hole 18–515 and a 5-metre intersection of 5.81 g/t Pd in hole 18–510. Development has commenced on an exploration drift to access the Camp Lake target located approximately 500 metres south and across a fault from the Offset Zone. The Camp Lake target is both down-plunge and south of the SLS reserves and holds the greatest potential for hosting a significant new zone of palladium mineralization in the immediate vicinity of the main LDI orebody. The new drift will also provide critical new drilling stations from which the projected extensions to the B1, B2, B3, C, Mystery and Sheriff South zones will be explored. Drilling highlights from the 2018 LDI surface exploration program are provided in Table 1. Drill hole locations and geophysical coverages are illustrated in Figure 1. In addition to the drilling completed at the Creek Zone, the Company also drilled several holes in the spring of 2018 in the vicinity of the Baker Zone, approximately half-way between the Roby Pit in the west and the Creek Zone in the east (Figure 1). This program was designed to follow up on historical drilling dating back to the 1990s that produced several intersections with grades between 1–3 g/t Pd over intervals of up to 16 metres. The best results in 2018 were obtained from hole 18–013, which intersected 1.37 g/t Pd over 164.0 m, including 11.4 m averaging 2.13 g/t Pd (Table 1). Based on these results, the Baker Zone remains a high-potential near-surface target. The Company will use the results of the recently-completed geophysical surveys to help guide the next phase of drilling at this target. Table 1. Selected surface drilling highlights from the 2018 Creek and Baker Zone programs. True thicknesses for Creek Zone intersections are estimated to represent 80–95% of reported interval lengths. True thicknesses for the reported Baker Zone drill intersections cannot be determined at this time. The analyses reported in this news release were performed by ALS Global in Vancouver, British Columbia. The Company’s rigorous internal quality control and quality assurance protocols are described in detail in the current Technical Report for its Lac des Iles Mine (October 2018) available on SEDAR and the Company’s website (www.nap.com). For the past two years, underground exploration at LDI has been focused on resource drilling beneath the current bottom of the shaft and south of the known Offset Zone reserves. Resource additions resulting from this drilling were included in the Company’s October 2, 2018 Technical Report that is available on the Company’s website. The recent drilling showed that the Offset Zone bifurcates into two discrete mineralized domains (southeastern and southwestern domains – Figure 2). These two domains collectively host at least three discrete pipe-shaped bodies containing relatively high-grade palladium mineralization that are referred to as the B1, B2 and B3 Zones (Figure 2). 2018 drilling highlights for these three zones are provided in Table 2. Exploration drilling completed in the fourth quarter of 2018, combined with recent underground rock chip sampling and a small number of historical exploration drill holes, delineated a new zone of palladium mineralization located 100 to 200 metres to the east of the Offset Zone. The new zone is herein named the C (contact) Zone, denoting its close proximity to the western contact of the LDI complex with the basement rocks. Initial drilling highlights from the C Zone are provided in Table 2. The C Zone target is approximately parallel to the Offset Zone and has an average thickness of 10 to 30 metres, an average length of 300 metres, and a vertical extent of at least 800 metres. The mineralization is hosted by rocks that are geochemically and mineralogically distinct from the principal host rocks to all of the known mineralization in the Roby and Offset Zones. Two other exploration targets located within the Offset Block in the general vicinity of the SLS mining area are now recognized as having the potential to expand down-plunge several hundred metres below their currently-defined limits. They include the Mystery Zone, located on the eastern side of the barren hanging wall gabbro unit to the Offset Zone (e.g., previously reported drill intersection of 15 metres of 6.33 g/t Pd in hole 05–012 and 8 metres averaging 7.01 g/t Pd in hole 17–901) and the near-surface Sheriff South Zone (e.g., previously reported drill intersection of 17 metres averaging 5.37 g/t Pd in hole 11–027) that is located directly south of the Sheriff Pit. Late last year, development of a new exploration drift was started to access the Camp Lake target, representing a large area of prospective geology located approximately 500 metres south of the Camp Lake fault (Figure 2). Only a few long drill holes from surface and underground have penetrated the Camp Lake target. Nonetheless, some of these holes encountered palladium-rich disseminated sulfide mineralization, having strong similarities to the Offset Zone mineralization (e.g., previously reported drill intersection of 31.86 metres of 1.51 g/t Pd including 5.83 metres averaging 3.76 g/t Pd in hole 14–918W1). These seven underground exploration targets collectively represent the best opportunities to extend the life of the underground operations and are expected to feature prominently in the Company’s underground drilling programs over the next several years. In addition to these targets, the Company is looking at options for extension drilling on the northeastern domain of the Offset Zone below the 1,000-metre level and beneath the current lower limit of the higher-grade Offset Central Zone resources (i.e., below the ~1,355 metre level). The Company plans to spend a minimum of $16M on exploration in 2019 including $10M of flow-through eligible expenditures based on the flow-through share financing completed in December. 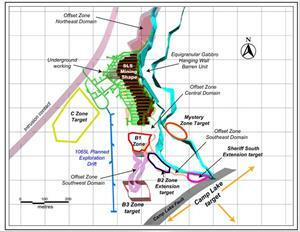 Last month, the Company re-commenced drilling on the Sunday Lake project. The current program is designed to test for higher-grade and more massive sulfide mineralization than has been intersected to date and will focus on several conductivity anomalies identified from geophysical surveys completed last year. Table 2. Selected underground drilling highlights from the 2018 LDI exploration program. True thicknesses are estimated to represent 45–95% of reported interval lengths based on current 3D geological and grade models. The technical content of this news release was reviewed and approved by the Company’s Vice-President, Exploration, Dr. Dave Peck. Dr. Peck is a Qualified Person under the meaning of National Instrument 43–101 and a registered Professional Geoscientist with the Association of Professional Geoscientists of Ontario, the Association of Professional Engineers and Geoscientists of British Columbia, and the Association of Professional Engineers and Geoscientists of Manitoba. North American Palladium Ltd. (TSX: PDL) (OTC PINK: PALDF) is a Canadian company with 25 years of production at Lac des Iles Mine, located northwest of Thunder Bay, Ontario. North American Palladium is the only pure play palladium producer in the world. With over 600 employees, Lac des Iles Mine features a unique world-class ore body and modern infrastructure, including both an underground mine and an open pit mine. Forward-looking statements are necessarily based upon a number of factors and assumptions that, while considered reasonable by management, are inherently subject to significant business, economic and competitive uncertainties and contingencies. The factors and assumptions contained in this news release, which may prove to be incorrect, include, but are not limited to: that the Company will be able to continue normal business operations at its Lac des Iles mine, that metal prices and exchange rates between the Canadian and United States dollar will be consistent with the Company's expectations, that there will be no significant disruptions affecting operations, and that prices for key mining and construction supplies, including labour, will remain consistent with the Company's expectations. The forward-looking statements are not guarantees of future performance. The Company disclaims any obligation to update or revise any forward-looking statements, whether as a result of new information, events or otherwise, except as expressly required by law. Readers are cautioned not to put undue reliance on these forward-looking statements. 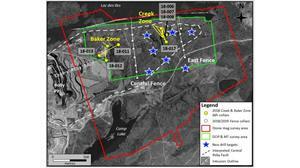 Figure 1: Plan map of the eastern part of the Lac des Iles Mine Property, showing the location of 2018 Creek and Baker Zone drill hole collars, planned and completed fence drilling collars, fall 2018 geophysical survey coverages, and current drill targets. Abbreviations: mag = magnetic; DCIP = direct current induced polarization; MT = magnetotelluric. Source: North American Palladium, February 2018. Plan view map of the Offset structural block, showing the outlines of the current top-ranked exploration targets in relation to current and planned mining infrastructure, major geological units and the Offset Zone 1 g/t palladium grade shell. Source: North American Palladium, February 2018.